My friend Sarah was introducing me at a concert I was playing at her church a number of years ago, and what she said clarified the nature and purpose of my work in a way I had never realized or thought of until that night, but which has given a focus to my writing ever since. That night, it became clearer to me what my ministry is all about. To give words to people to pray when they struggle to find on their own. That’s the purpose of my new album. I’ve been using “Orbits” as the working title for the album. As I reflect on my journey with Christ over the past 20 years, I have noticed at least two forces at work. Like a planet, orbiting a star, there is a centrifugal force generated by my own selfishness and desire for autonomy that constantly pulls me away, threatening to send me spinning off into oblivion. Sometimes the force I generate is greater, sometimes lesser. Sometimes I feel like Mercury. So close to the light that I am blistering from the heat. 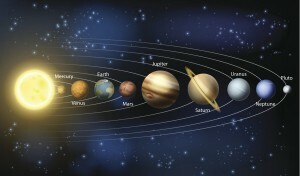 Other times I feel like Pluto, wondering if I’m even still a planet at all. And yet, I am held by another force generated by the gravity of a star far greater by degrees of magnitude in size, brightness and warmth. This force is constant, relentless. And it’s the only thing that keeps me from the desolation of space. “Orbits” (which is a tentative title, by the way) is a collection of prayers, all in various orbits. Not all of the songs will resonate immediately with any one person at any one moment. Rather, the album will function more like a prayer book or the book of Psalms in the scriptures. A collection of prayers, there for when you need them. My prayer is that all my work, and these prayers in particular, will give you the words to pray when you can’t find the words on your own.